Honduran Caravan Crosses Guatemala, Traveling Toward U.S. The caravan, which could consist of up to 2,000 migrants, began its journey from Honduras on Monday. The migrants have already become symbols in the ongoing battle over border security. Honduran migrants wait in line to cross over the border checkpoint into Guatemala in Agua Caliente, Honduras. A new caravan of at least several hundred Hondurans has set off toward the United States on foot or in vehicles. Some have already crossed into Guatemala. 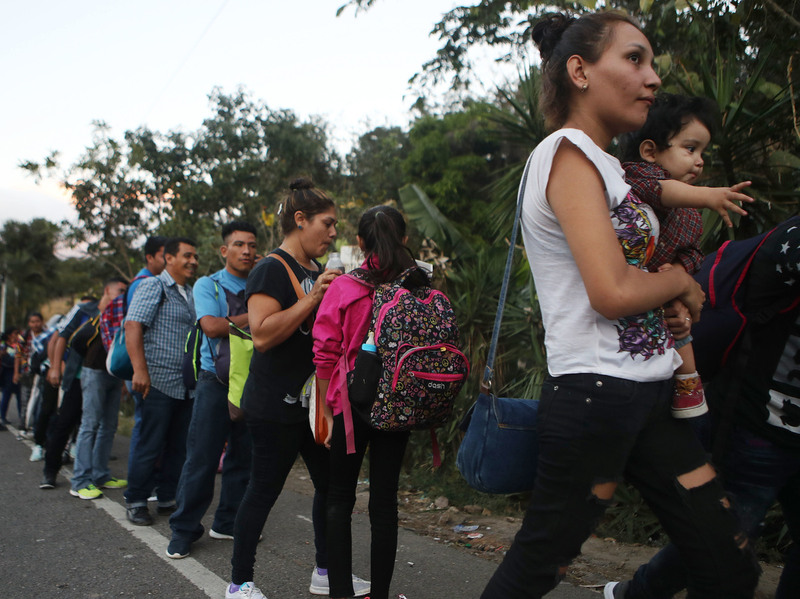 Honduran officials have estimated the caravan consists of between 800 and 1,000 people, The New York Times reports. Honduras' National Human Rights Commission says there could be as many as 2,000 migrants in the caravan. Some are traveling by foot, and some hitched rides to the Guatemalan border. "We are going out of necessity, because of the poverty," a former police officer, Edilberto Hernandez, told the AP. After losing his job he could find only low-paid construction work, he said. He was traveling with his wife and four children. Secretary of Homeland Security Kirstjen Nielsen said the U.S. is "closely monitoring" the caravan. "To be clear — participation in a caravan does not grant you a special status or provide you special treatment," she said. The earlier caravan became a pivotal issue in the midterm elections, as Trump used the specter of hordes of criminals crossing the border to energize his base. U.S. Customs and Border Protection officials hardened the border in November as they prepared for the first caravan's arrival, installing concertina wire and positioning barricades. U.S. agents fired tear gas at members of that group of migrants, who they said were trying to breach the border. UPDATE: Another migrant caravan headed to U.S.
Nearly 1,000 people from Honduras. Designed to overwhelm our system & undermine U.S. law. If this caravan reaches the U.S., migrants wishing to seek asylum will join thousands of migrants from October's caravan who are still waiting their turn to apply, The Washington Post reports. "I want to apply for asylum in the U.S., but I would stay in Mexico if I had to," 23-year-old Jimmy Senteno, traveling with his 5-year-old daughter, told the Post. Senteno said he hadn't been able to find work in Honduras, and he was afraid to leave his house because of gang violence. So he decided to take his chances with the caravan. "I know only some in the last caravan made it, but I have to try."